Yesterday, we announced the release of GS-series, a variant of the G-series with support of Azure Premium Storage, for Microsoft Azure Virtual Machine. The GS-series combines the power of G-series with the performance of Azure Premium Storage, providing the best of both worlds, and an ideal solution to your most demanding workloads. GS-series allows up 64 TB of disks to be attached to a single VM, and up to 2,000 MB per second of disk bandwidth. These sizes are equivalent to the G-series Virtual Machine sizes in processor, memory and pricing. Similar to DS-series, each GS-series VM is allocated a fixed-amount of SSD, managed by a component called Blobcache, to provide a low-latency, high-throughput cache for the persistent disks using Premium Storage. As a result, each GS-Series VM is allocated a smaller amount of local SSD storage compare to its G-Series counterpart. For more information on the caching architecture, please see Azure Premium Storage, now Generally Available. At this time, these Virtual Machine sizes are available only in West US, East US 2 and West Europe. Note: GS-Series VMs cannot be in the same Cloud Service as A-Series, D-Series or DS-Series VMs. These different VMs can be placed into the same Virtual Network as long as it is a Regional Virtual Network . Also, optimizing outstanding IOs may be necessary to hit optimal performance, application performance may vary. Navigate to the Azure Preview Portal, select New(+) and select your favorite OS or VM image. 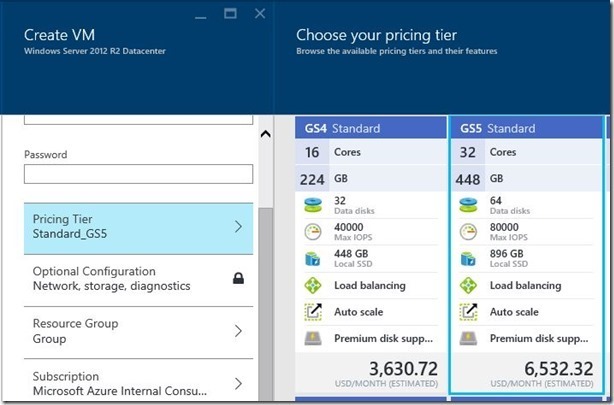 Click through Pricing Tier and select Standard_GS5 Virtual Machine size. Specify required configuration information and hit Create. Delete the existing DS-Series Virtual Machine without deleting the disks. Create a new GS-Series Virtual Machine. Re-attach the data disks to the GS-Series Virtual Machine. Stop the existing G-Series Virtual Machine. Copy the existing data disks to a Premium Storage Account. Resize the G-Series Virtual Machine to a GS-Series Virtual Machine. Attach the disks from the Premium Storage Account. Similar to DS-Series, GS-Series also supports Linux virtual machines. Please refer to Using Linux VMs with Premium Storage for more details. On CentOS 7.x, the VM may run into a known issues: https://bugzilla.redhat.com/show_bug.cgi?id=1235523. Disable console output will work around the issue. On Oracle 7.0, please contact Support to receive instructions for updating and configuring VMs with Premium Storage Disks. If you would like more information on the GS-Series VM sizes and other Azure VM sizes please see the following page for additional details: Virtual Machine and Cloud Service Sizes for Azure. For more information on Premium Storage, please see: Premium Storage overview.